PHILIPSBURG - Member of Parliament (MP) Silvio Matser (51) and Pointe Blanche prison Director Edward Rohan (52) will appear in front of a Judge in the Court of First Instance on Wednesday, January 31, to answer to allegations of vote-buying fraud during the 2014 parliamentary election. “Octopus” is the code name for the investigation into the alleged vote-buying during the 2014 election. Matser was arrested in March 2016 and was held for 10 days. His arrest stalled the handling of the 2016 draft budget in Parliament, as it came on the day the budget debate was expected to wrap up in Parliament. Matser is accused of having made phone calls to Rohan to obtain information about the procedures at the House of Detention during elections and about the number of eligible voters with Dutch nationality among the prison population. Rohan confirmed that such telephone conversations had taken place and that he had provided the then-candidate for United People’s (UP) party with the requested information, which included a list of eligible inmates in the prison, the Prosecutor informed the Court during a pro-forma hearing on October 13, 2016. Matser’s co-defendants, including then-prison-inmates Franklin Ash (47) and Edeson Fleming (37), are all suspected of having cooperated with the scheme to recruit voters for UP or for Matser in exchange for payment of US $100 in prison canteen money, or the handing out of beach and market stall licences, or assistance in obtaining a chauffeur’s job. In this way, some 13 prison inmates were approached with requests to cast their votes for UP, according to the Prosecutor’s Office. In the investigation, which is led by the Prosecutor’s Office and carried out by the National Detectives Agency, some 20 persons were considered suspects. One of those could not be traced and another suspect has passed away. A total of 14 suspects were detained when the investigation started. In October 2016, the Court suspended the preliminary hearing in the investigation for an indefinite time to allow additional hearings of witnesses and to give defence lawyers time to listen to wiretapped telephone conversations that form a significant part of the evidence against their clients. The Court ordered that those telephone conversations that are in the file should be worked out integrally and in detail and made available to the defence. Matser, who currently is an MP for United St. Maarten Party (US Party), will not be contesting the February 26 snap election. Police Inspector Steven Carty and former prison guard Wilfred Williams took over the day-to-day operations at the Pointe Blanche prison on February 20, 2017. The two law-enforcement officials were appointed to replace Rohan, who had been asked to go on extended leave of absence. 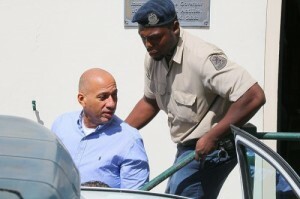 Then-Minister of Defence Rafael Boasman said at the time that Rohan had agreed to leave the prison and allow the Minister to “normalise” the situation there.